Anyone are very welcome to answer my CQ calls. But if I’m specifically calling CQ DX or CQ <country / continent> I expect that you respect this and do not call me unless you meet these specified conditions. Otherwise I don’t care if you are a beginner or an old timer, QRP or QRO, a DX or non-DX and wherever in the World you live. QSL via Logbook of The World (LoTW). 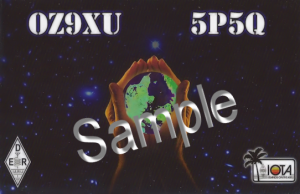 I upload QSOs to ClubLog and QRZ.COM logbooks, but do not consider these as QSLs. 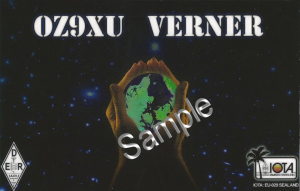 Upload are usally done daily if any new QSOs (between 21.00 and 23.59 UTC). QRP stations are logged with call sign only without /QRP, just as I don’t log QRO stations as <call>/QRO. If your account at eQSL and/or LoTW are signed with <yourcall>/QRP only, you will NOT receive any QSL. It’s OK, free of charge but a bit slow. 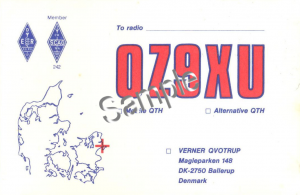 Try to avoid the bureau service and use Clublog OQRS or direct mail if you need my QSL card. I don’t need your QSL card IF our QSO has been uploaded to/confirmed on LoTW. 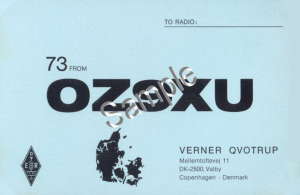 IF you really need my QSL card, please use Clublog OQRS. Bureau card service is still open for receiving QSL cards. Postage in Denmark has increased dramatically in recent years, so I’m compelled to ask for 5 GS (5 US$) or 4 EUR for return postage. No IRCs please, but a SAE is very welcome. IRCs is discontinued (sale and redemption) in Denmark. You can order QSL via bureau or direct on ClubLog OQRS. Bureau card is free of charge, for direct postage payment are via the Paypal system (4.5 US$). Direct QSL (OQRS or by mail) will be answered as soon as possible. QSL cards received directly without sufficient funds for return postage will be answered via the bureau. QSL cards are send to the OZ Bureau every 3rd month (January, April, July and October) or when I have at least 100 cards to send. My last delivery to the bureau: April 1, 2019. ALL QSL cards received will be answered in the same way they are received. 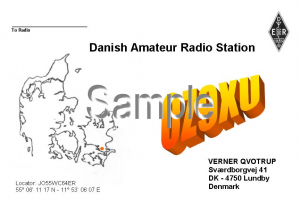 SWL QSL from SWL’s are welcome and will be answered 100%, both as paper and using the eQSL system. However, the report must be a QSO. Reporting me calling CQ or CQ DX will not be sufficient and will not be answered. My previously used QSL cards. 2011, used shortly (Home made). 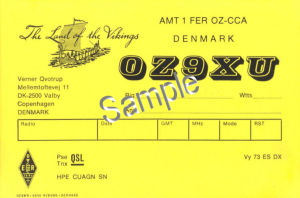 When used with call sign OV5O a label is added. Other testing designs may have been used shortly from 2011 onwards.